A few cookies, a coffee, and some candy to get through some work before the end of the day. I came home and Dave had a couple of homemade pizzas waiting for me. Then we watched Murder on the Orient Express. We stayed up until midnight with plans of booking our camping sites for Canada Day weekend but it turns out the registration time is 7:00 am so we stayed up late for nothing. We did get some campsites the next morning, although not our first choices. Dave and E went to the ski hill, and Q and I went to swimming. This time though, after our lesson, we got in the car and drove up to Barrie to meet the boys. 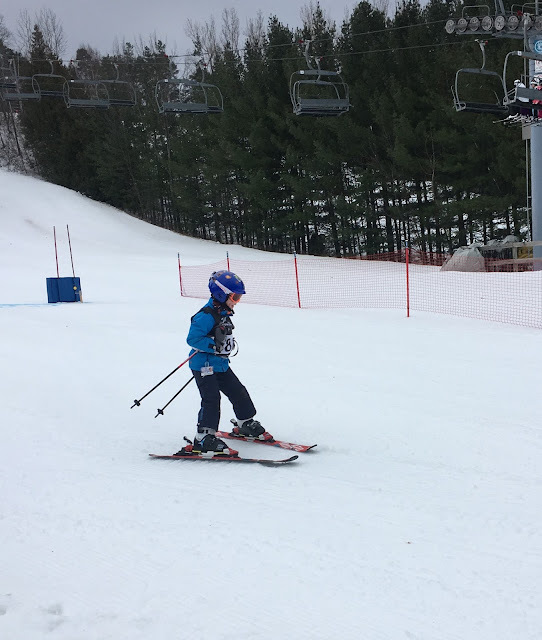 Saturday was E's first ski race so I wanted to go and see him. We arrived in time to see his first run, he did a second run before lunch. We ate lunch with them and then went home. The weather was nice and warm so it was a pleasant morning on the hill; I was glad I got to see E race. He did well and hit all of his gates. We were all tired that evening so we watched a bit of Lego Batman and then went to bed early. At least most of us did. Dave may have stayed up late watching Thor. Then E and I went upstairs for the service. Our congregation was celebrating our anniversary of being an affirming congregation. That means that we welcome people from all walks of life, sexual orientations, gender identities, economic positions, abilities, etc. A big rainbow flag canopy welcomed us. E was sitting in the kids' area before the service started and then ran over to me after the choir had gone up. He wanted me to come over and see his tower, but it wasn't really the time for me to get up so I gave him my phone and told him to take a photo so he could show me. That worked. When we got home E did his homework and all of his Valentine cards for his class while I finally wrote my thank you notes. After Q woke up I took him to the grocery store with me. His shirt was dirty from sampling a granola bar. Dave and E had gone for a walk down by the river. You may remember my photos of the flooded river last week. The water has receded but has left a pile of ice. Meal prep for the week - zucchini muffins and lentil soup. As usual we finished our weekend with a recorded Saturday Night Live and a somewhat early bedtime. Hearty looking soup and muffins! Enjoy seeing the boys enjoying the winter weather.